A ponytank is a smaller tank, which is carried additionally to the mostly single main tank. It possesses its own regulator with first and second stage and sometimes a gauge too. It will be mounted either at ones side or in front of the body or fixed at the main tank. The volume varies from 1l to 4l. It has to be enough to ensure a safe ascent by a complete independent air supply in case of an emergency. 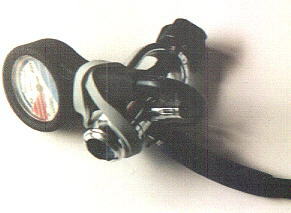 The necessary volume varies with depth and profile of the dive. While a simple dive to 20m without any deco stops doesn't need more then 1l/200bar, a dive with deco stops up to 40m into a wreck may require at least 4l/200bar. The alternatives to the ponytank are in the whole the SpareAir appliances, 0,5-1l tanks with direct mounted single stage regulator and dual tanks with isolating manifold or separated tanks. While SpareAir is regarded as toys by most (too little volume, unreliable), the solution of dual tanks is quite expensive and unwieldly. More about that at Pony Advocation Page. I didn't like any of these solutions, so I made my own one, which combines some of the above mentioned points. 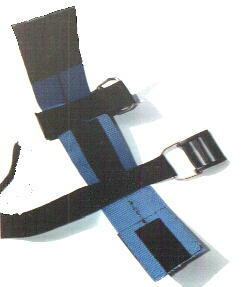 Two especially stiff weight belt straps are layed side by side and sewn. 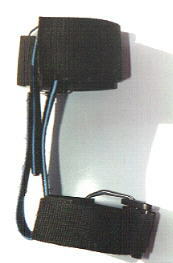 Two short BC-straps are fixed across them with the distance of the straps of the BC (that doesn't work with only one BC-strap). You can buy a ready one and shorten it or put one together on your own (cheaper!). The wide strap is bent outside the pony tank straps - a vice may help ! Additional velcro holds the parts together. For mounting you put the wide strap around the BC-straps and fix it with the velcro. Then put the BC onto the main tank fixing the strap. Now you can easily mount the pony tank, which may stay in place when changing the main tank. A single strap would be enough for the vertical one, but the pony wouldn't be as firm. The wider doubled strap has enough tension to ensure a good fix. 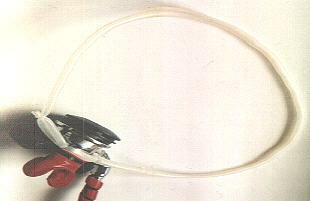 I carry the regulator of the pony tank around the neck with a piece of surgical tubing. The endings are put together and joined by cable ties to form an opening for the mouth piece. There is a small pressure gauge made by Oceanic that will be connected directly to the first stage. I took a normal gauge with 10cm of hose which is held at the first stage by two rubberbands. I found a very cheap way to make a pony bracket for under 20 dollars. I use galavised pipe to form a square, 1/4 inch pipe. I then got rubber foam to put around the pad. A big hose clamp is put around the pipe and pony. I bought a bc belt and put that between the pipe and the pony tank. I can remove the pony at any time to move between tanks. This added approx 3 lbs to my tank, so I removed that weight from my weight belt. Actually it only added 3 1/2 pounds to the weight of the pony at the surface. I use one strap and I have never had it slip. It's the same type of strap that you use to strap your tank to the bc. Plus with using the strap, you can remove it. You could use another clamp and mount it to another tank on a more permanent basis. 1 3" 1/4 galvanized pipe.